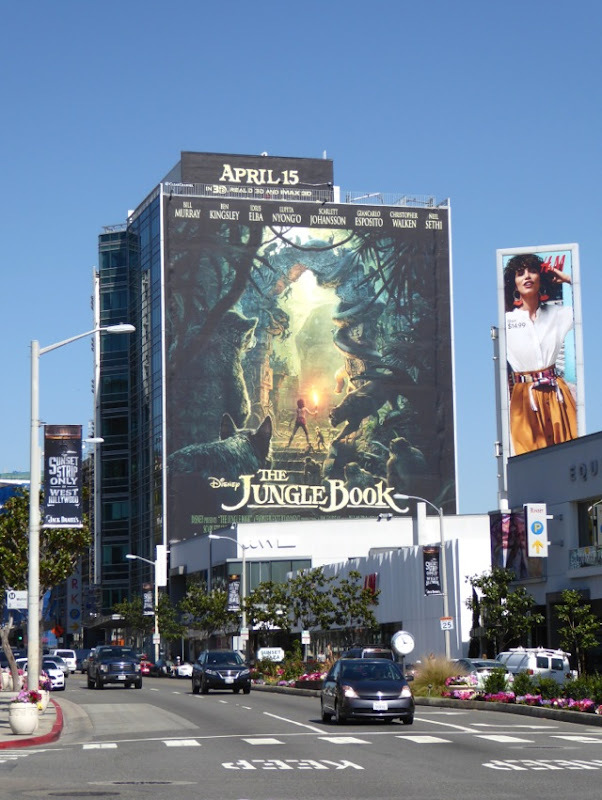 Most people will still remember Disney's 1967's animated musical adventure, The Jungle Book, with affection, but now by the magic of modern technology (and a dash of pixie dust), 'Mowgli' the man cub and all his animal friends (and foes) are back on the big screen in a new live-action version. 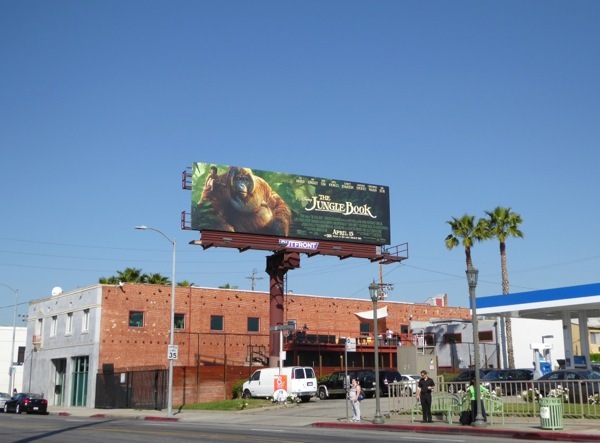 This time director Jon Favreau breathes life into the orphaned boy (played by newcomer Neel Sethi) raised by wolves, a bear and a black panther, in the cinematic adaptation of the literary works of Rudyard Kipling. 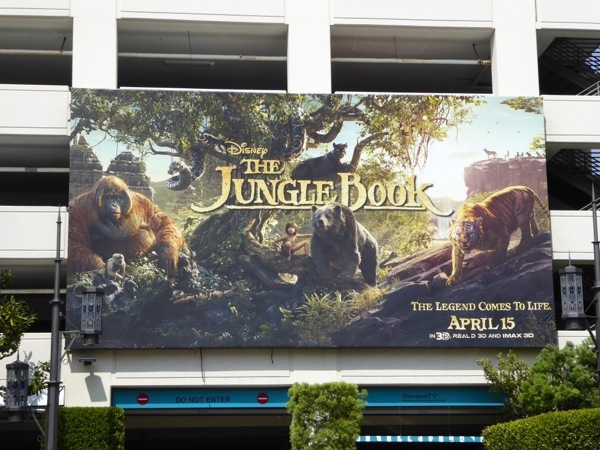 If the spectacle of all these speaking animals of the jungle brought to life wasn't enough to entice you, they're also played by a star-studded cast of recognizable names (and voices). 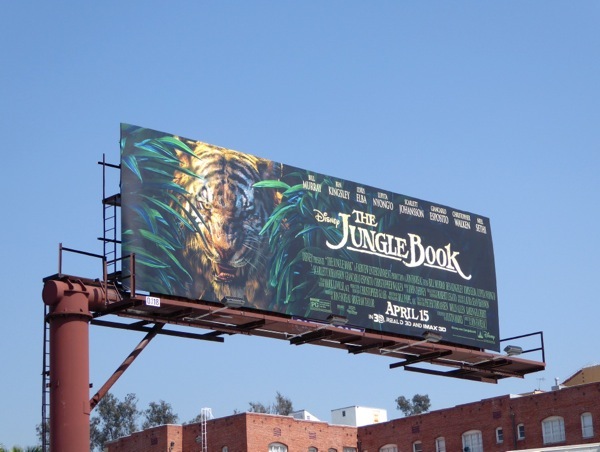 Lupita Nyong'o voices the Indian wolf 'Raksha' who helped raise Mowgli, and Bill Murray and Ben Kingsley voice his guides through the jungle, 'Baloo' the bear and 'Bagheera' the black panther. 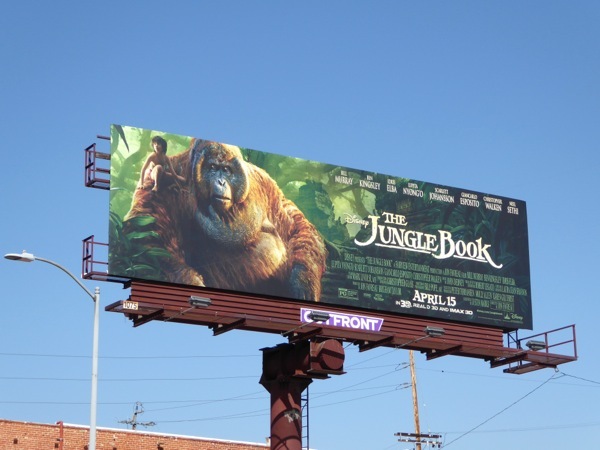 Not all of the animals on his journey back to civilisation are friendly though, and Scarlett Johansson voices the giant python 'Kaa', Christopher Walken voices the Orangutan-like 'King Louie' and Idris Elba plays the man-eating 'Shere Khan' Bengal tiger. 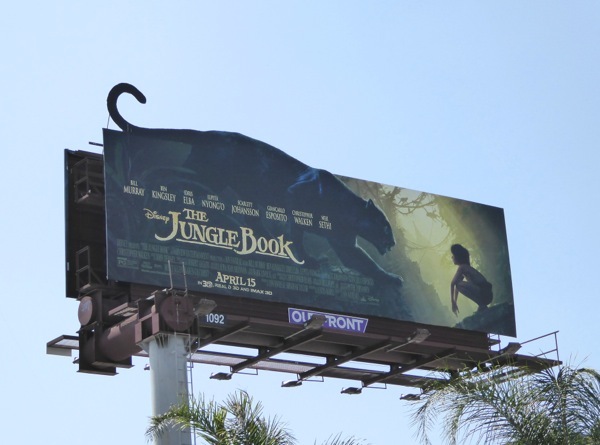 This outdoor ad campaign for The Jungle Book certainly stands out around the skies of L.A. and evokes the nostalgia of the classic cartoon version. 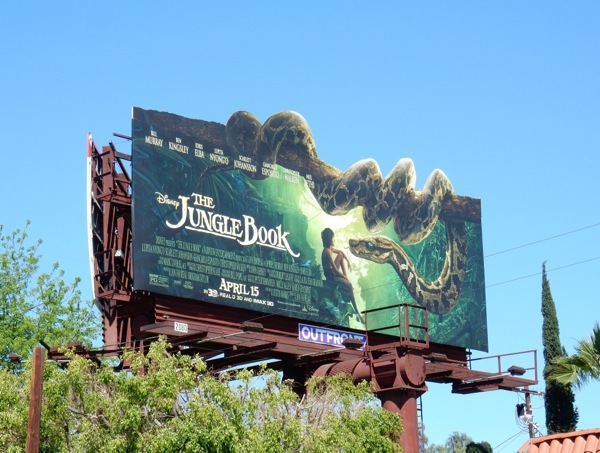 The giant-sized Disney billboard was first spied towering over eastbound traffic along West Hollywood's Sunset Strip on March 16, 2016. 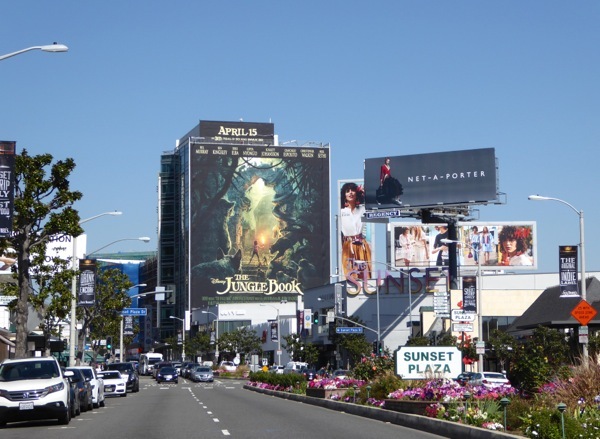 Meanwhile the other eye-catching landscape and cut-out special extension billboards were spotted around the streets of L.A., including Santa Monica Boulevard, La Brea Avenue, The Grove shopping centre, La Cienega Boulevard and Cahuenga Boulevard, from March 17 to March 23, 2016. 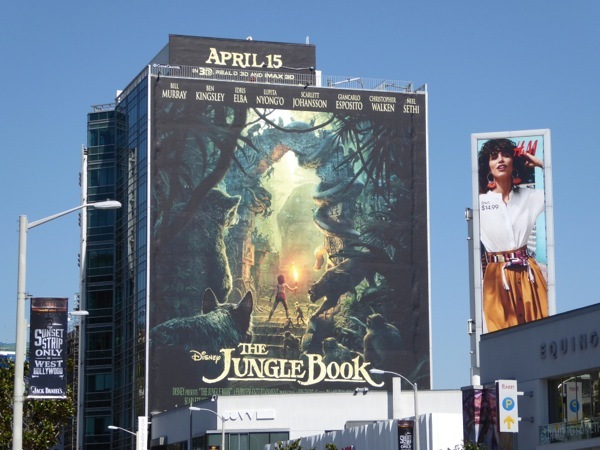 Interestingly Warner Bros. Studios has also been developing a movie based on The Jungle Book, with motion-capture maestro Andy Serkis making his directorial debut, but that's not due out until next year and is currently titled Jungle Book: Origins. 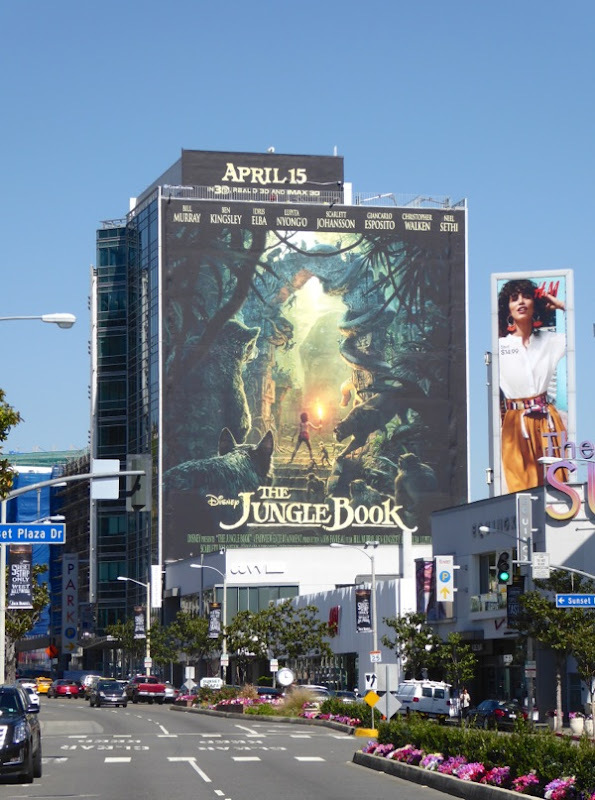 Only time will tell which movie will be king of the jungle, especially as another Tarzan film is heading to cinema screens this summer, so by 2017 people may be a bit over hanging out in the jungle. 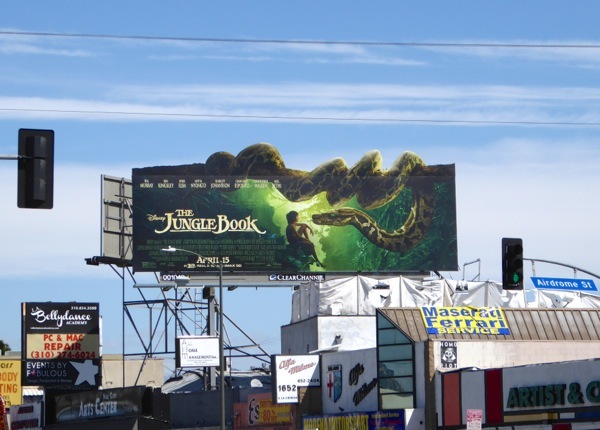 More importantly though, what will their billboards look like after these fine specimens? 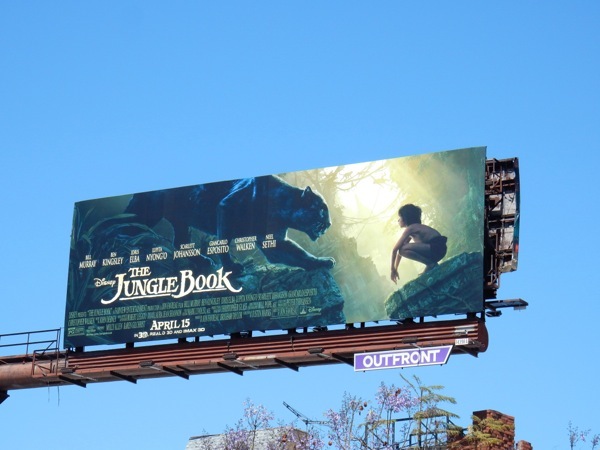 UPDATED: To celebrate The Jungle Book's blockbuster opening weekend in the U.S., here's also a standard version of the Bagheera ad creative, spied in better light above Santa Monica Boulevard. 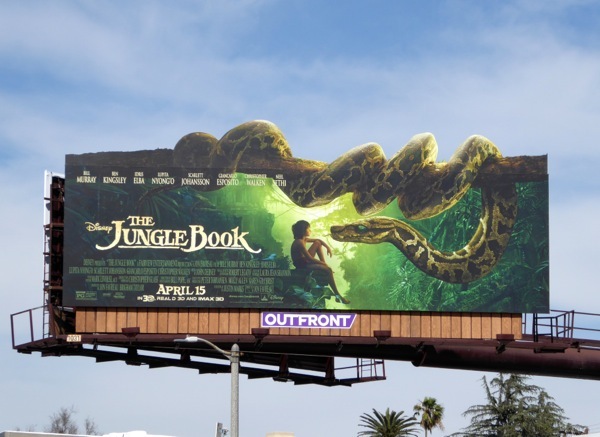 And another example of the giant cut-out snake, Kaa, spotted along Riverside Drive at Cahuenga Boulevard on April 17, 2016.